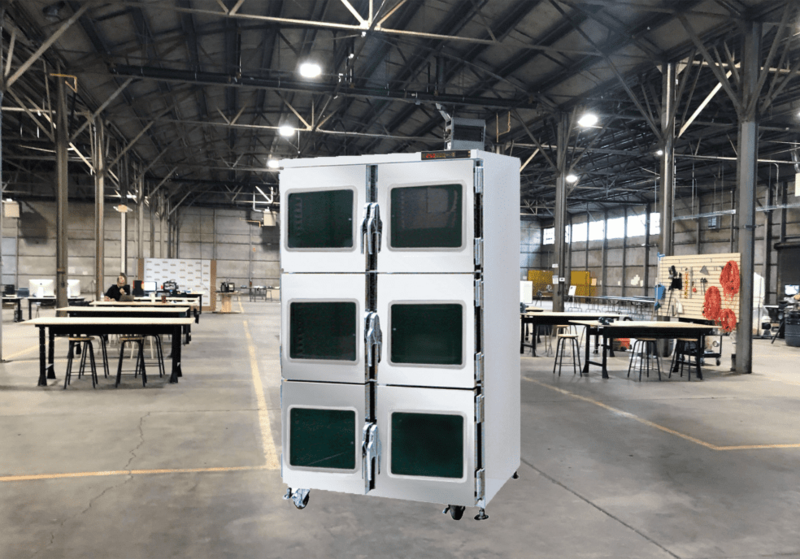 An Electronic Desiccators also know as a Dry Cabinet or Dry Box, are air-tight automatic dehumidifying storage cabinets which maintain an internal environment of 1-50% RH. Desiccant Cabinets are used to protect objects from moisture & humidity related damages such as rust, oxidation, and warping. A Dry Cabinet is ideally suited to protect and store Surface Mount Technology (SMT) Parts and Feeders, Moisture Sensitive Devices (MSD), 3D Printing Materials, Moisture Sensitive Materials, Semi-Manufactured Goods, Automated Production Parts, Quality Control Equipment, Printed Circuit Boards (PCB), Circuitry, Resistors, Chemicals, Powder Materials, Gold Contact Lead Wires, Solder, Solder Paste and other manufacturing related materials. SMT Industrial Supply is the Premier North American Dealer for Dr. Storage Dry Cabinets, the number one selling dry cabinet in the world. Based in Whitby, Ontario, all of our Dry Cabinets are manufactured and in-stock at our North American duty free warehouse. Why Dry Cabinets are Important? Increasingly, plastic encapsulated components, semiconductors, are being manufactured in smaller sizes. 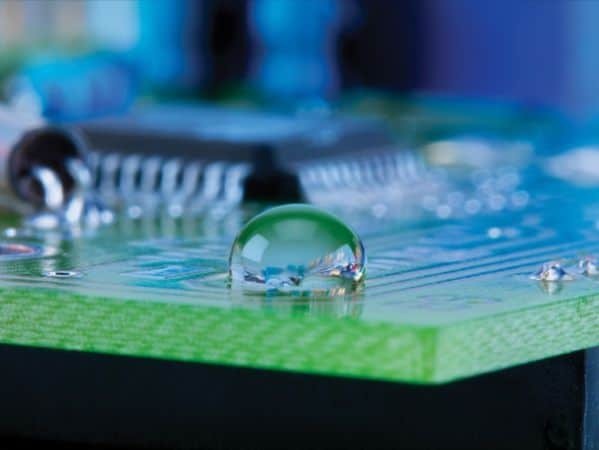 Components such as thin fine-pitch devices and ball grid arrays could be damaged during SMT reflow when moisture trapped inside the component expands. These types of surface mount components need to be protected from the humidity that occurs in the factory environment. Microcracking is just one defect that can occur. Damage to plastic molded components such as PBGA’s has long been recorded and associated with high ramp rates and temperatures of the re-flow process during assembly. Through experiment and subsequent examination both with scanning electron microscopy and acoustic microscopy, cracking and de-lamination of packaging occurs and can cause intermittent or complete device malfunction. The Dr. 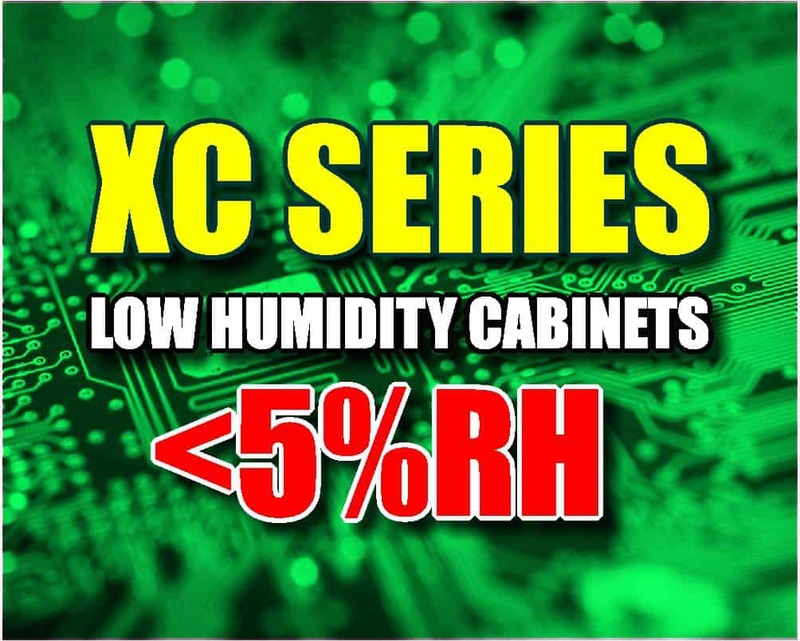 Storage XC Series of Industrial Quality Dry Cabinet are our most economical models and are specially designed to store moisture sensitive Surface Mount Technology (SMT) Components and Printed Circuit Boards (PCB) used in high tech manufacturing. All of our Desiccant Dry Cabinets are built to comply with the industry standard J-STD-033. The Dr. 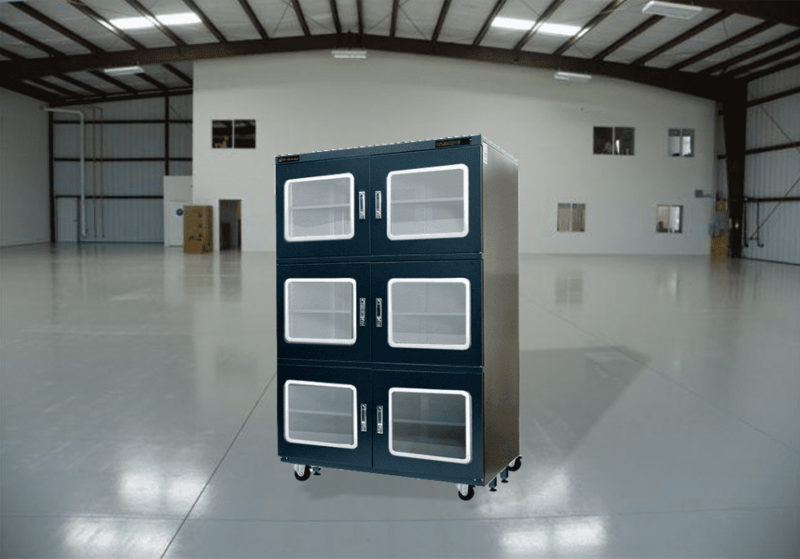 Storage XC Low Humidity Cabinet is plug and play, features a rugged air tight design and are available in six different sizes. All XC Series Dry Cabinets come standard with an anti-static package, adjustable shelves, wheels, locking doors, decimal digital display and a countdown calibration reminder. The Dr. 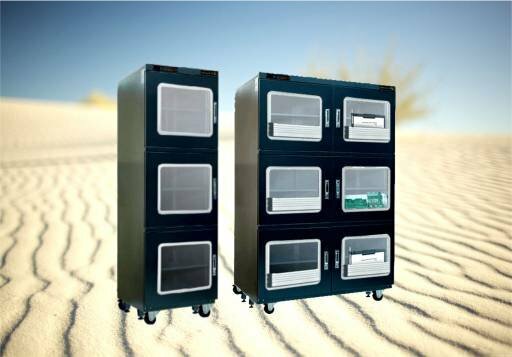 Storage X2B Series of Industrial Quality Desiccant Cabinets are slightly more advanced than our entry level XC Series Dry Cabinet models. Built to maintain an internal environment of <5%RH, they feature an added LED Display Control Panel to simultaneously display temperature & humidity values. The Dr. Storage F1 Series is an Ultra Low Humidity Dry Cabinet and features humidity ranges of 1%RH, exceeding the requirements of the IPC and Jedec J-STD-033 standards. These Dry Cabinets offer higher humidity control compared to our XC Series. The F1 Dry Cabinet is specially designed to prevent the oxidation of moisture sentitive high tech manucaturing devices and components. All F1 Dry Cabinets are supplied with Humidity Manager Software so humidity and temperatures conditions inside the dry cabinet can be monitored and saved to the software. Coloured graphs are drawn and the data can be used for validating processes or to show compliance to standards. 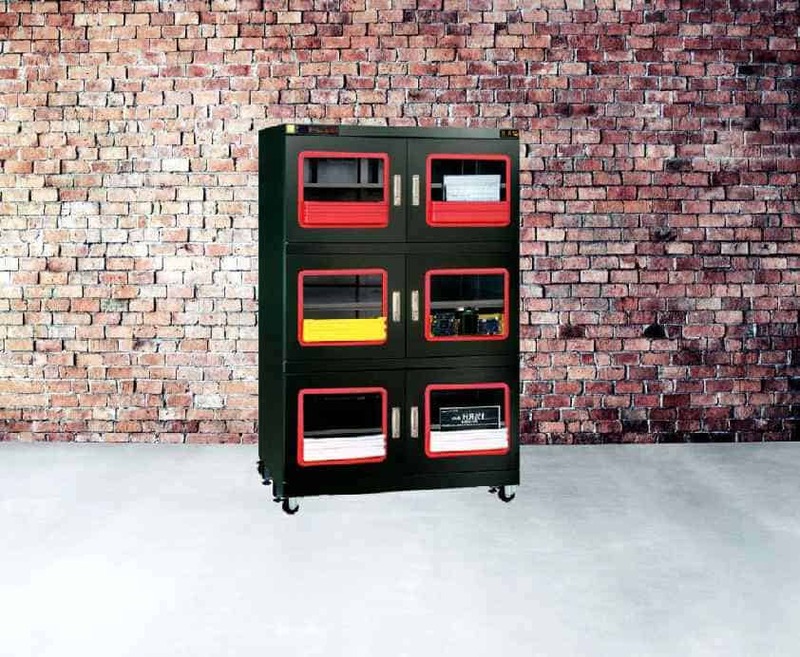 All F1 Dry Cabinet models are supplied with an anti-static package, adjustable shelves, wheels, locking doors, decimal digital display, countdown calibration reminder, and sensors with 2% accuracy. Designed as a dual purpose dry cabinet the Dr. Storage T40W & T60M Series of Dry Cabinets can be used as standard Humidity Controlled Storage Cabinets or as 65°C Baking Cabinets. Baking stored components in a 40℃ or 65℃ environment can in many cases “reverse the clock” by removing stored moisture. Unlike baking at the traditional 125℃, baking at lower temperatures can lessen the risk of rapid moisture expansion. The lower temperature mitigates the oxidation and the stored parts can then be baked indefinitely. Perhaps for this reason IPC/JEDEC J-STD-033B dictates that you should never bake components or printed circuit boards at 125°C, more than twice in their life time. 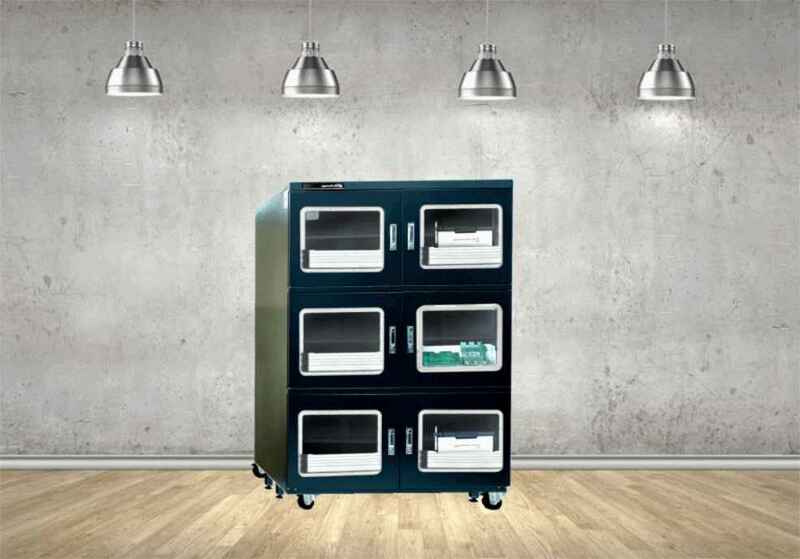 QDB Smart Nitrogen Dry Cabinets are designed to control the filling of user supplied dry air into the cabinet, so the desired relative humidity in the cabinet can be reached. The QDB Smart Nitrogen Cabinet is adjustable from 1%~50%RH. The dry air can be nitrogen, CO2 or inert gas. Nitrogen Gas is the most classic and common choice of dry air. The use of Nitrogen as a dry air protects components or samples sensitive to the level of ambient oxygen in the atmosphere and subsequent oxidization. Due to the nature of Nitrogen as a dry air, the QDB Smart Nitrogen Dry Cabinets have a faster recovery rate than a desiccant dry cabinet. All QDB Dry Boxes come complete with a QDN filling module, digital display, RS-232 port, humidity manager software, anti-static package, locking doors, adjustable shelves, alarm, conductive wheels (except for the QDB-200), calibration reminder, and are black in color. This cabinet provides optimal protection for electronic components such as IC’s and PCBs . QDB Smart Nitrogen Cabinets are the ideal cabinet for storing semi-conductors.